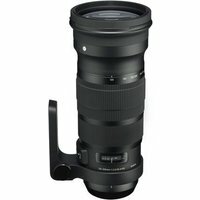 The Sigma 120-300mm f2.8 DG OS HSM Lens Nikon Fit is a telephoto zoom lens that joins Sigma's Global Vision Sports line of customisable and fast aperture lenses. This dust- and splash-proof lens is designed to enhance usability and deliver superior optical performance, even in the most challenging situations. Using the Sigma USB Dock (not included, available separately) users can fine-tune and personalise certain functions of the lens to fit their shooting style, such as the focus limiter, autofocus speed and update the lens' firmware. The HSM (Hyper Sonic Motor) delivers high AF and extremely quiet performance, while full time manual focus override leaves the professional touches in the photographer's hands. The OS (Optical Stabiliser) makes it possible to use shutter speeds approx. 4 stops slower than would otherwise be possible and enables hand held photography. This DG lens is designed for Nikon DSLRs with an FX full-frame sensor, but other Nikon cameras with a cropped sensor will also work.